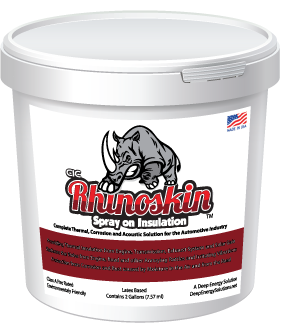 To block heat loading from exposure to the sun on metal panels on the exterior walls. CIC Heat Block Reduces Riverside Building Temperature by 20˚F Metal panels on two exterior walls of this Riverside, CA office building were coated with Ceramic Insulation Coating (CIC) Heat Block in May, 2015. The building has metal panels between the windows and very high AC costs during hot months. Before applying CIC coating, AC started at 8:30AM and ran continuously until shut off at 5:00PM. 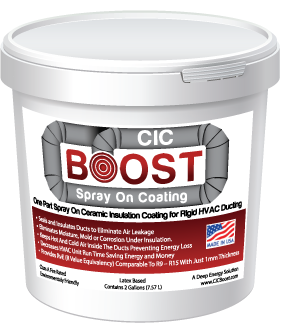 After coating with CIC, AC doesn’t start operating until noon and runs intermittently during the afternoon. Test panels coated with Ceramic Insulation Coating measured 123˚F on uncoated area and 103˚F on coated area at 11:00AM based on measurements using a FLIR TG165 Imaging IR Thermometer. Ambient outside temperature was 91.1˚F. 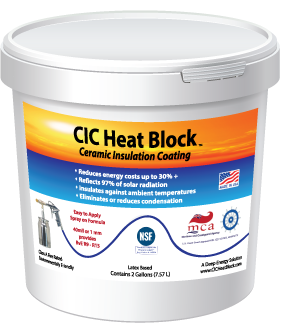 The 123˚F on the exposed outside surfaces demonstrates the effect of solar heat loading and the 20˚F reduction clearly demonstrates CIC Heat Block’s ability to also reduce interior heat loads. Reducing outside wall temperature lowers inside wall temperature and air conditioning costs.